Harry Keaton wrote a guest post for us, showing us how he made the armature for his Laurence of Arabia sculpture. Armatures for two-legged critters (humans, birds…) is a real challenge. Thanks, Harry, for sharing your ideas with us! 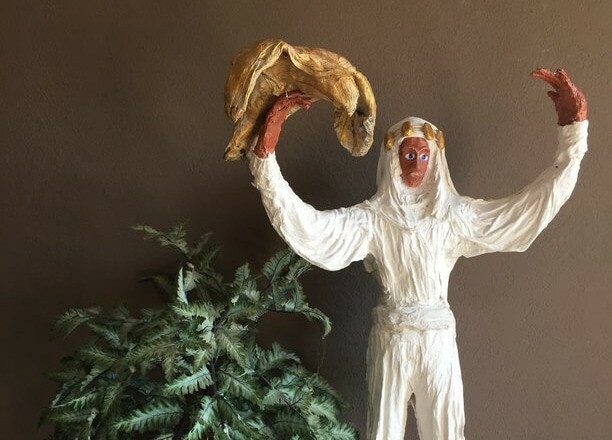 My paper mache’ sculpture was based on Peter O’Toole’s role in the 1962 movie “Lawrence of Arabia.” The real Lawrence of Arabia was a blue-eyed English/Irish soldier who was a military leader during World War I. Over the years Lawrence has become almost a mythical hero. In the movie version, Peter O’Toole’s costume was a brilliant white. That almost blinding white costume was one thing I wanted to bring out in my sculpture. 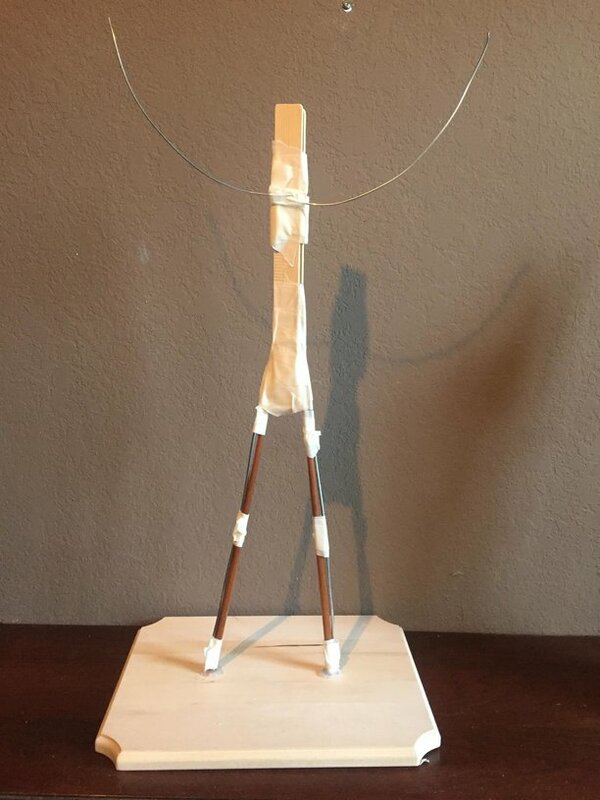 The first stage of my sculpture was creating a strong standing armature. For the armature, I used two extra long chop stick, one for each leg. (My extra long Chop sticks are 14 inches long, purchase on Amazon.) I decided the distance I wanted between the feet and drilled two holes completely through the wooden base. I inserted each chop stick and hot glued them in each hole. I then cut nine gauge wire and reinforced each leg, using masking tape to attach each chop stick to the wire. I used painters wooden paint paddles for the body. (Can be purchase at most any store selling paint, I purchase 10 paddles for a total of 99 cents.) I used two paddles with a third paddle cut shorter and placed between the other two paddles. I taped them in place, then used nine gauge wire across the body and in between the two paint paddles to form the arms. I hot glued the arms so they would stand up. The second stage is forming the body. Padding the armature to form the body. For the second stage, I shaped the body using aluminum foil. After the shape was completed, I covered the aluminum foil with masking tape. 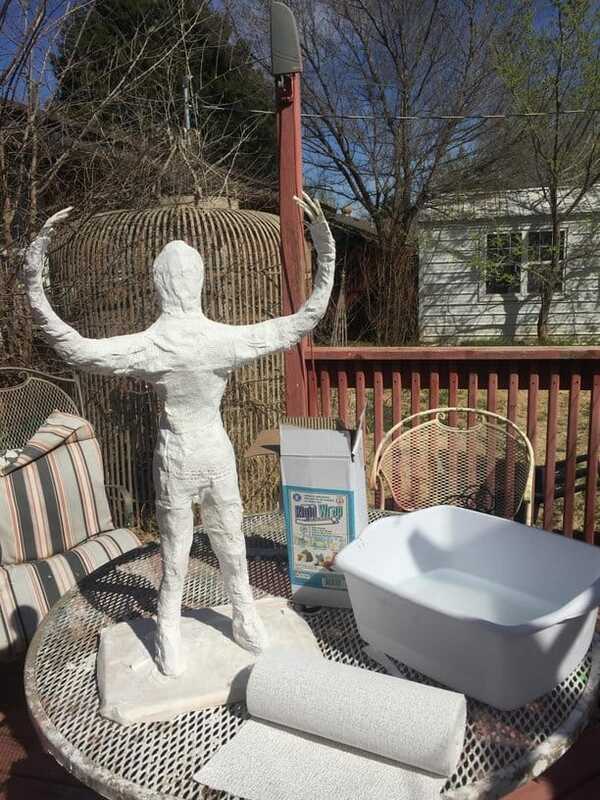 For the third stage, I moved the sculpture outdoors for the plaster wrap. Adding the plaster wrap outdoors. The third stage was done with plaster wrap cloth. You cut the plaster wrap cloth and dip each strip in water and wrap it around each body part (overlapping is fine). Cut smaller strips of one to two inches wide, dip in water and wrap the body. The plaster wrap helps firm up the body. I only use one coat of plaster wrap, but if you wish you can use two layers, it won’t really matter since the entire body will be covered with his clothing. I purchased the plaster wrap cloth from Amazon. You can see the box in the picture to see the type I used. The roll is out of the box, so you can see what it looks like before being cut and dipped in water. The fourth step is completing the sculpture. I don’t have a picture of me applying the dipped paper towels, because it is somewhat messy and I didn’t have anyone here to take the pictures. I am using a completed picture once again and will describe the process of draping the towels below the picture. I think with the aid of this picture and my description it will be easy for you to understand. The final stage is draping his costume with paper towels. I used Viva smooth finish paper towels dipped into white Gesso. (For those who might not have used Gesso, it is a thick glue like liquid used on raw canvas, to seal the surface before doing an oil painting and also stiffen the canvas. Most canvases now come pre-coated with gesso.) Most any art store or hobby shop will have large bottles of Gesso. I first tore off one Viva paper towel, dipped the towel into a bowl of full strength gesso and got both sides wet with the gesso. I gently pulled the towel through two fingers to remove some of the excess Gesso and then wrapped the wet towel around his foot and shaped it to the height I wanted the boot. I did this on each foot almost up to the knees. I then took another paper towel and dipped it and put it at the top at his waist and bloused it out down to the top of his boots. I did this on each side creating his ballooned pants. I covered his chest and his back with two other dipped paper towels to form a tight fitting sleeveless shirt with somewhat of a collar. The next step is creating a head dress and leaving only the clay face to be painted when the sculpture is completely dry. Each person will do their own take on what ever costume they are designing. I hope my directions are clear and I have helped anyone wanting to learn how I sculpt a figure. When complete, this figure is paper from head to toe, except for the wire hands and the face. The sculpture is 28 inches high. The very last step is to paint the costume. 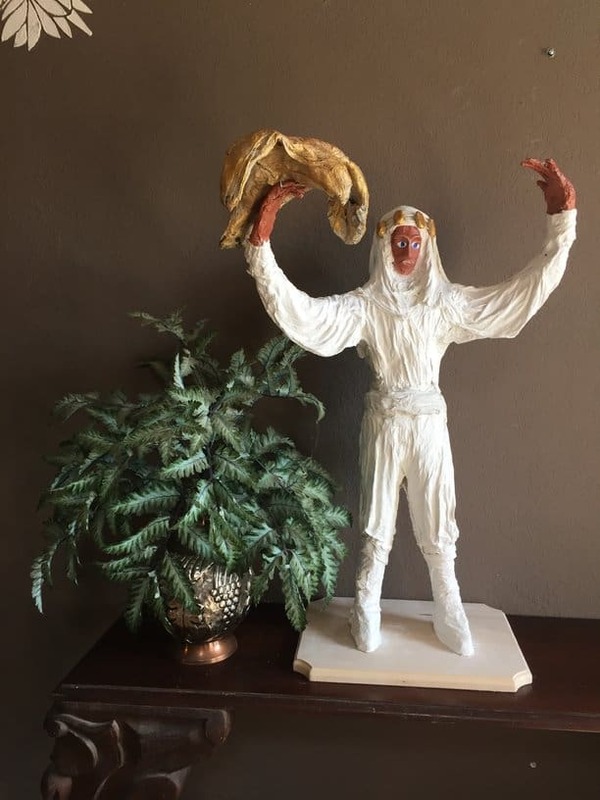 Since Lawrence of Arabia wore brilliant white attire and I used latex bright white gesso, I did not have to paint anything but his two gloves and his clay face. The golden falcon was formed with aluminum foil and covered with a dipped Viva paper towel. I dry brushed the falcon with metallic gold paint. Good luck with your sculpture. Hope you have lots of fun creating with paper mache’. Very nice and good tutorial as well! I wish you included how you made those tiny hands!! ? I suspect that he cut five short pieces of wire, long enough for each finger plus enough extra to attach to the wire that goes inside the arm. Then he might have used some aluminum foil to make the fingers thicker, or maybe he just added enough masking tape to fill them out – that would be a lot easier. Harry, This is so helpful to me, thank you. Can you tell me how much your 28″ piece weighs? I live in mid-coast Maine, and will be looking for someone to help me make a giant form sculpture. Do you now of an artist who might help? Frederica, I don’t know if Harry is still watching his post for comments. You might want to also put a comment on the Daily Sculptors page, because one of the regular readers of that page might know of a sculptor in your area. It’s always worth a try. There’s a link to the Daily Sculptors page at the top of the site. Good luck! And one more thing – you might want to call your local university’s theater director – he or she might have a student or know of a local artist who’s familiar with the kind of work you need. Hi Christine, thank you for taking time to reply. I am glad you like the sculpture. I hope you will give my method a try. Harry – I think your Lawrence of Arabia is fabulous, and thank you for sharing the making of a Legend! 🙂 I love that it’s based on an historical figure. Victoria, I am pleased that you liked my paper mache’ sculpture of Lawrence of Arabia. Thank you for the link, beautiful pieces of sculpture dating back to World War 1. Your creation is wonderful. How grand it must be to create what you want. Thank you for sharing. Hi Martha, glad you liked my mache’ sculpture. 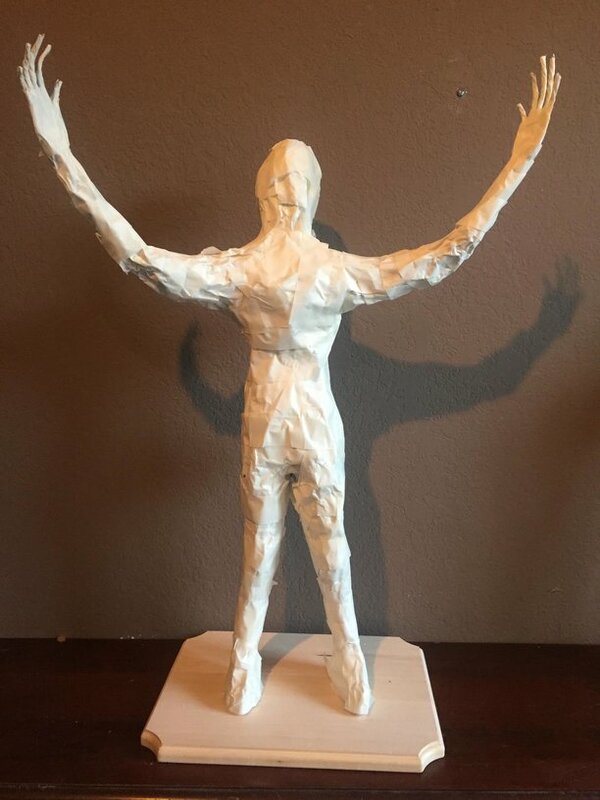 My first two sculptures were of animals, but I am finding the figure sculpting is my main interest. Thanks Harry for the well done tutorial. What a fun character to do….who is next? Hi Eileen, I am presently working on a sculpture from the 1930 movie “Whoopee”, starring Eddie Cantor. The movie was a Ziegfeld production and believe it or not, it was filmed in color (lots of pink). The character I am working on is the Sheriff. The costumes are over the top,,,,lol. He is wearing a ten gallon western hat. His boots have silver studs along with his wrist guards. At that time (1930), men wore their pants above their waist. In the movie, the Sheriff was dashing, wearing riding pants, he had an elaborate costume. If you get a chance, go to You Tube and just type in “The Eddie Cantor movie Whoopee” you will able to see several different musical numbers. Be prepared to be blinded by the color “pink”. (Of course you must remember the cowgirls and cowboys were there to the Sheriff’s wedding. Evidently the bride to be loved PINK. Who ever designed the costumes put the color pink not only on the women, but many of the musical numbers featured cowboys wearing black and white cowhide chaps and pink western shirts. One of the few characters in the movie wearing a white shirt was The Sheriff. I own a copy of the movie and have always wanted to do either a painting or a sculpture from the movie. This one sounds fun! Hope you share progress & finished photos! That sounds fun. I did go on youtube and you are right, there was a lot of pink! I recognized some of the songs but never knew of the movie…it must have been quite scandalous in those days. Good luck on your character and make sure you show us when you are done! Harry, your Lawrence is beautiful! The clothing is really well done, but I especially like the drape of his sleeves. Thank you so much for sharing. Joyce, I am glad you liked the Lawrence of Arabia sculpture. The sleeves were a little difficult. I would finally get one sleeve exactly like I wanted it and then could not duplicate the same sleeve on his other arm,,,,lol. There were three of four redo’s until they matched. Thank you for sharing your work. Really nice drape of the clothing. I’m going to try your technique. Harry, it is beautiful and in its simplicity of use, you make it look so easy. It looks wonderful on your mantle. We would love to see more of your work.